Hi everyone, welcome to our comprehensive update on Teamwork in Business. If you are interested in a detailed article about what is teamwork, benefits of teamwork, then you have stumbled on the right post here. In this post, you would get all the necessary steps needed to build a successful teamwork for your business. But before we bag into giving you these steps let's briefly explain what a teamwork means and its benefits. What Is a Team? How Does Teamwork Work? A team (business team or a work team) is a group of people with complementary skills who work together to achieve a specific goal. In the case of Motorola’s RAZR team and Apple Inc., the specific goal was to develop (and ultimately bring to market) an ultrathin cell phone that would help restore the luster to Motorola’s tarnished image. It wasn’t supposed to set sales records, and sales in the fourth quarter of 2004, though promising, were in fact fairly modest. Back in September, however, a new executive named Ron Garriques had taken over Motorola’s cell phone division; one of his first decisions was to raise the bar for RAZR. Disregarding a 2005 budget that called for sales of two million units, Garrigues pushed expected sales for the RAZR up to twenty million. The RAZR topped that target, shipped ten million in the first quarter of 2006, and hit the fifty-million mark at midyear. Talking on a RAZR, declared hip-hop star Sean “P. Diddy” Combs, “is like driving a Mercedes versus a regular ol’ ride. Jellicoe and his team were invited to attend an event hosted by top executives, receiving a standing ovation, along with a load of stock options. One of the reasons for the RAZR’s success, said Jellicoe, was that “It took the world by surprise. Very few Motorola products do that.” For a while, the new RAZR was the best-selling phone in the world. 5) Operate in a social context. Why do major organizations now rely so much on teams to improve operations? Executives at Xerox have reported that team-based operations are 30 percent more productive than conventional operations. General Mills says that factories organized around team activities are 40 percent more productive than traditionally organized factories. FedEx says that teams reduced service errors (lost packages, incorrect bills) by 13 percent in the first year and this why teamwork is so important in an organization. Self-managing teams (also known as self-directed teams) have considerable autonomy. They are usually small and often absorb activities that were once performed by traditional supervisors. A manager or team leader may determine overall goals, but the members of the self-managing team control the activities needed to achieve those goals. Self-managing teams are the organizational hallmark of Whole Foods Market, the largest natural-foods grocer in the United States. Each store is run by ten departmental teams, and virtually every store employee is a member of a team. To do its job, every team has access to the kind of information—including sales and even salary figures—that most companies reserve for traditional managers. Not every self-managed team enjoys the same degree of autonomy. Companies vary widely in choosing which tasks teams are allowed to manage and which ones are best left to upper-level management only. Let's have a look at this, for example, self-managing teams are often allowed to schedule assignments, but they are rarely allowed to fire coworkers. Why is it good to work in a team? Now that we know a little bit about how teams work, we need to ask ourselves why they work. Not surprisingly, this is a fairly complex issue. In this section, we’ll explore why teams are often effective and when they ineffective. Members depend on each other. When team members rely on each other to get the job done, team productivity and efficiency tend to be high. Members work well together than individually. When team members perform better as a group than alone, collective performance exceeds individual performance. When each member is encouraged by other team members to do his or her best, collective results improve. Team members enjoy being on the team. Some of these factors may seem intuitive. Because such issues are rarely clear-cut, we need to examine the issue of group effectiveness from another perspective—one that considers the effects of factors that aren’t quite so straightforward. The idea of group cohesiveness refers to the attractiveness of a team to its members. If a group is high in cohesiveness, membership is quite satisfying to its members. If it’s low in cohesiveness, members are unhappy with it and may try to leave it. It’s easy for leaders to direct members toward team goals when members are all on the same page—when there’s a basic willingness to conform to the team’s rules. When there’s too much conformity, however, the group can become ineffective: it may resist fresh ideas and, what’s worse, may end up adopting its own dysfunctional tendencies as its way of doing things. Such tendencies may also encourage a phenomenon known as groupthink—the tendency to conform to group pressure in making decisions while failing to think critically or to consider outside influences. Failure to cooperate can occur when members don’t or won’t commit to a common goal or set of activities. What if, for example, half the members of a product-development team want to create a brand-new product and half want to improve an existing product? The entire team may get stuck on this point of contention for weeks or even months. Lack of cooperation between teams can also be problematic to an organization. Every team requires organizational resources to achieve its goals, and if management isn’t willing to commit the needed resources— say, funding or key personnel—a team will probably fall short of those goals. Like it or not, you’ve probably already notice that you’ll have team-based assignments in college. More than two-thirds of all students report having participated in the work of an organized team, and if you’re in business school, you will almost certainly find yourself engaged in team-based activities. “In the real world, you have to work with people. You don’t always know the people you work with, and you don’t always get along with them. Your boss won’t particularly care, and if you can’t get the job done, your job may end up on the line. Life is all about group work, whether we like it or not. And school, in many ways, prepares us for life, including working with others. She’s right. In placing so much emphasis on teamwork skills and experience, business colleges are doing the responsible thing—preparing students for the business world. A survey of Fortune 1000 companies reveals that 79 percent use self-managing teams and 91 percent use other forms of employee work groups. Sometimes we hear about a sports team made up of mostly average players who win a championship because of coaching genius, flawless teamwork, and superhuman determination. But not terribly often. In fact, we usually hear about such teams simply because they’re newsworthy—exceptions to the rule. Typically a team performs well because its members possess some level of talent. Members’ talents must also be managed in a collective effort to achieve a common goal. As a student and later in the workplace, you’ll be a member of a team more often than a leader. Team members can have as much impact on a team’s success as its leaders. A key is the quality of the contributions they make in performing non-leadership roles. What exactly are those roles? Whether you affect the team’s work positively or negatively depends on the extent to which you help it or hinder it in meeting these two challenges. Finally, a few characteristics of another kind of team-membership role. So-called blocking roles consist of behavior that inhibits either team performance or that of individual members. Every member of the team should know how to recognize blocking behavior. If teams don’t confront dysfunctional members, they can destroy morale, hamper consensus building, create conflict, and hinder progress. 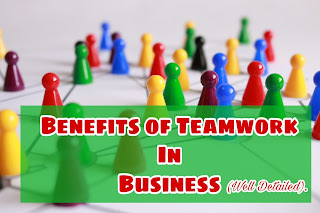 So there you have it, teamwork strategies and benefits of teamwork to help maximize your ability to work in a team or even in the workplace. If you’ve had success with any of these please feel free to share your results in the comments section.